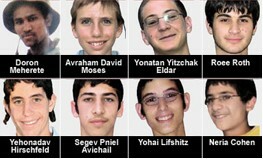 Eight students at Yeshivat Merkaz Harav were massacred March 6 by a Hamas terrorist. Kaddish for victims of Jerusalem bombing. A small but resolute group of mostly Philadelphia-area Jews recited Kaddish for the eight students massacred in Jerusalem and received assurances of support for Israel from the Clinton and Obama camps during a rare Israeli solidarity rally at Love Park across the street from City Hall. With biblical undertones, the March 19 rally was held at noon as scheduled during a break in the rain. One onlooker quipped, “That is no accident.“ The low-turnout rally, drawing 400 people, was not covered by the main general-circulation daily newspapers that cover Philadelphia. The rabbi, who moderated the rally, recounted Israel’s peace gestures in contrast to Arab terrorism that culminated in the shooting deaths of eight male students on March 6 at the Mercaz Harav yeshiva in west Jerusalem. He is executive director of VAAD: Board of Rabbis. Rabbi Gutterman led the recitation of Kaddish, the Jewish prayer for the dead, midway into the rally. Participants who seconds earlier cheered the speakers, including students who also chanted, danced and held signs in support of Israel, fell into solemn prayer. Democratic presidential rivals U.S. Senators Hillary Rodham Clinton and Barack Obama conveyed messages of support for Israel. through Philadelphia Mayor Michael Nutter, for Clinton, and Congresswoman Jan Schakowsky, for Obama. Schakowsky, who is Jewish, represents many Jewish neighborhoods on the North Side of Chicago and near North suburbs such as Skokie and Evanston. She is the Democrats' chief deputy whip in the House of Representatives. Clinton, Obama and Sen. John McCain, the presumed Republican nominee for president, have all taken positions in strong support of Israel. In fact, McCain toured Sderot the same day as part of a world tour. This tour has been widely viewed as an effort to make Senator McCain appear presidential in contrast to Clinton and Obama as they continue to slug it out. This rally was the first of its kind sponsored by Federation since July 2006 when local Jews stood in solidarity with Israel during its two-front war with Hamas and Hezbollah. The 2006 rally was held at the same location. Cantor Marshall Portnoy of Main Line Reform Temple in Lower Merion led attendees in singing the American National Anthem and then Hatikvah, Israel’s anthem.